The Butler is the decade-spanning, tearjerking tale of White House butler Cecil Gaines, an African-American man born into abject poverty in the cotton fields of the Deep South, to become one of the longest-serving White House butlers in American history. Its' glowingly expensive production values detail the most turbulent decades of the 20th century, awash in a yellowed, evocative light. It is loosely based on the true story of butler Eugene Allen, who served at the White House from the Eisenhower to the Reagan administrations. In the divisive early years of his work, Cecil is repeatedly told, 'The room should feel empty when you're in it'; not just a butler's instructions but ultimately another encouragement for the silence of Black Americans all over the nation. Many of the strongest points of the film are some of the most vile portions of US history; the humiliation of Civil Rights protestors at lunch counter sit-ins are particularly harrowing, fiercely recalling the shame and disgust of those years. The family and personal histories of this remarkable man are intertwined with some of the most significant moments of American history; the growing political consciousness of his eldest son peaks along with the headiest days of the Civil Rights movement. A growing rift between father and son's sensibilities reflect the generational struggle of the counterculture years. JFK's assassination is mirrored in a low ebb at home, where Cecil's wife, portrayed fantastically by Oprah Winfrey, has sunken into depressive alcoholism. If any of this seems potentially transparent, this is often the case; at its worst, The Butler has a weepy flair for the melodramatic - and sometimes, the obvious. The superstar cast also is occasionally distracting; while Oprah disappears into her role through sheer talent, the short turns of John Cusack as Richard Nixon and Robin Williams as Dwight D. Eisenhower seem jarringly out-of-place, and closer to caricature. Nonetheless, the inconsistencies of the film are countered by a deeply poignant and colourful tract of the Civil Rights movement; it is effective through its humanism, and through its' demonstratively fascinating subject matter. Cecil does occasionally feel like the Forrest Gump of butlers - witness to too much of the latter half of the 20th century for it not to seem silly. But such is the nature of the Oscar-baiting melodrama; we can expect a certain amount of bloated self-importance, and in The Butler's case, it becomes easy to overlook. We are almost held hostage to its poignancy, such is the weight and emotional force of the events shown. 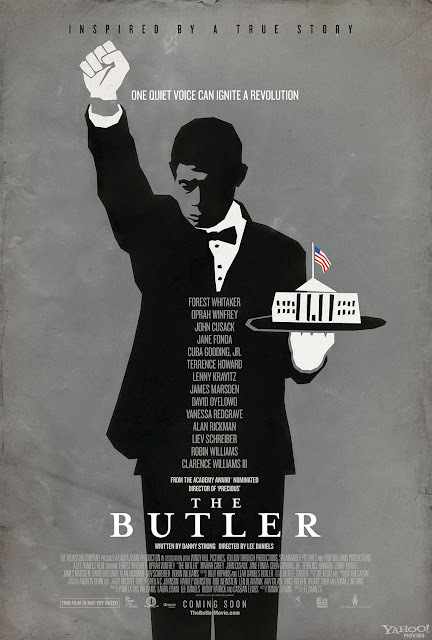 Even with its weaknesses and uneven moments, The Butler's grounding in reality and the strong central performances allow for a compelling historical drama. The victorious, optimistic conclusion- including Barack Obama's 2008 election - may be overstating the positive. Yet a great deal of progress did come, and largely through the achievements of those who fought, and sometimes died, for Civil Rights. Daniels' heartfelt thank you to those who did so, alongside an equally heartfelt, earnest film, may be easy to laugh off or dismiss, for some. But neither trait is worthy of disdain; and while The Butler is heavily flawed, it is redeemable ultimately for its warmth and depth of feeling. Currently showing at Nottingham's Broadway Cinema.